Saturday night we decided to cheap date to the library. After bringing home several really good books I decided to start with Cat Bordhi's New Pathways for Sock Knitters #1. Here is the first practise set. 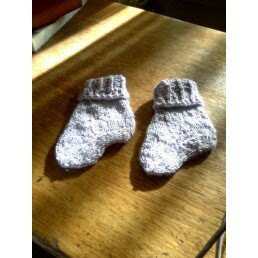 They are a toddler sock for a friends daughter. Shinny purple synthetic of reuse so I don't know the fiber content. (child has animal allergies) so this is the result. It made me tense that it looks so odd on the needles when you are used to traditional patterns but the urge to frog was successfully defeated. I like the way they fit. Though I think that there will be lots of learning before I get the technique down pat.